First off this was by far the coldest I’ve ever been before a show. Idecided to arrive at the venue about 1 hour and 30 minutes early to pick up my ticket and get in line early. It was snowing outside and freezing and I decided to wear just a long sleeve plaid shirt and jeans. By the time I finally got in I was so cold I had lost all feeling in my hands, feet, and face. It was funny trying to talk to everyone in line since everyone was so cold their mouth wouldn’t move correctly. Now the two opening bands didn’t really have a setlist since they were just DJ’s. Around 6:30 doors were opened and I managed to get about 20 feet from the stage in the center. Stood around for another hour or and around 7:30 J Devil (aka Jonathon Davis) came out and did his DJ act. Now he was really good in getting the crowd pumped up and he had tons of energy while doing it. He was constantly running around the stage and jumping around. He was really just having a good time. The light show was also great for him and they have screens behind him projecting random things the entire show for all bands. Now he only played for like 20 minutes until around 7: 50 or so. 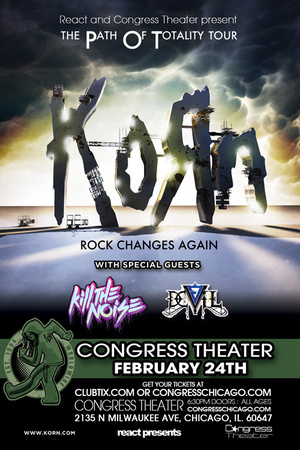 Next up was Kill The Noise, another DJ who did some songs on Korn’s latest album. He came out just randomly with no intro, introduced himself, and started. Now he was good and all but it’s really hard to wanna dance to dubstep or anything when it’s nothing but guys around you. It did sound great though and dubstep live is awesome and really heavy. I remember he did a remix of Five Finger Death Punch’s “Under And Over It” which was pretty decent. Live though he has little to no energy since he didn’t leave his table on stage the entire show. Also the light show for him was pretty horrible compared to J Devil. Around 3/4th’s through his show though you could tell people were ready for him to get off so Korn could play. He was good and all but he seemed to play for around 45 minutes and it all started sounding alike. At 9:30 though Korn came on and the place exploded. The nearly packed house just turned into everyone jumping, screaming every word, and the pits were going crazy. I was in the pit 15 feet from the stage for the majority of the show and it was great. Just tons of people running around going crazy. Korn was spot on and Fieldy is insanely buff now. Also JD is really skinny. The new material was great live and really if you didn’t know it was dubstep infused, it really just sounds like normal Korn. JD sounded amazing and their drummer was really going at it. Also his kit is insanely big and almost monster like. Freak On A Leash was of course amazing to hear live as was JD walking on stage playing bagpipes as the opener of the encore for Shoots And Ladders. When they did the part of “One” the crowd just lost it but really the second they played the first chord of “Blind” the entire place just went over the top insane. After the show everyone from the band came back out to throw drum sticks, picks, all that. Also JD seemed really happy to have everyone there and he gave a speech thanking us and saying how happy he was to be doing this and how we are the greatest for supporting Korn through the years. It really boiled down to him saying how happy he was to be playing for us and he wished everyone a good night, good weekend, and a safe trip home which I thought was nice. Overall the show was crazy and well worth the frostbite and cold trip in line and back home. For anyone wondering Korn played from 9:30 to like 11:05.